Do you believe your struggle with anger stems from the wrong behavior you see displayed in your children? The knee-jerk reactions and blowups you're facing are often a result of a bigger set of "triggers". Some of these are external, like a child's disobedience, back talk, or selective hearing, while others are internal, like an overflowing schedule, sleep deprivation, or perhaps your own painful experiences from childhood. Triggers: Exchanging Parent's Angry Reactions for Gentle Biblical Responses examines common parenting issues that cause us to explode inappropriately at our children. 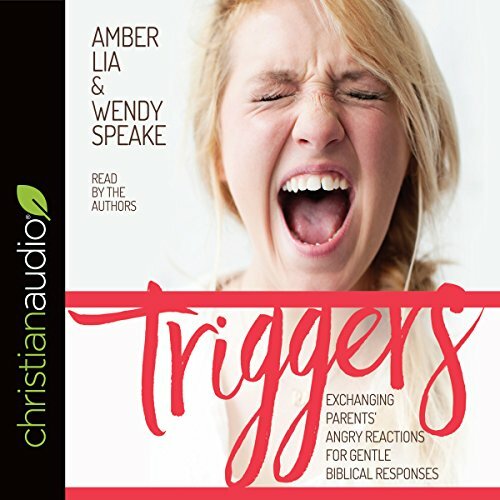 Moving beyond simple parenting tips on how to change your child's behavior, authors Amber Lia and Wendy Speake offer biblical insight and practical tools to equip and encourage you on the journey away from anger-filled reactions toward gentle biblical responses. I will choose God's path. This will be a book I will listen to again. Such a good book to listen to as I parent my 5 kids. I did this book as a Bible study and it was really eye opening! I was having difficulties after I had my second son and this really helped me to see what my triggers are and how to handle them. I listened to this book through audible.com. I was not given this book in exchange for a review. This book was recommended to me by Mirror Ministries, an organization that helps restore local victims of human-trafficking. They have a heart for the hurting and have a plethora of resources and recommendations for healing. I enjoyed listening to the authors’ voices and the information they provided was insightful and helpful. I love that there is a chapter specifically focused towards parenting children with health conditions. They give multiple examples of ways our children sometimes trigger us and provide various examples of how to cope through them. The biggest piece of advise I plan on implementing moving forward is to not try and teach a lesson when triggered. My plan moving forward is address the behavior, make the correction then take a “break” to write down what about that situation bothered me, why I felt a correction needed to be made, and develop a “training plan” to move forward. ▪️ Shift focus from fixing “tempers” to praying as we endure the child rearing days. I’ve implemented this by turning on worship music and praising my way through the tough days as well as the good ones. ▪️ The power of “uh-oh” as an exclamation pointer to remind our kids and warn them that they have “stepped out of bounds”. This way they are gently reminded they created a faux pas while still keeping the mood light and supportive. ▪️ Meet their bad behavior with good behavior. ▪️ The Holy Spirit is responsible for controlling their moods and hearts, not us. We are here to be their earthy guidance and comfort. ▪️ Schedule family meetings in advance to remind everyone of family expectations and standards. It’s ok to “pause” a teaching moment especially if you’re (I’m) struggling to control my own moods. ▪️ Keep the meeting positive and remind everyone that we are all working together for the greater family good. We as parents want what’s best for our children. ▪️ If you are feeling overwhelmed and feel like the household responsibilities are not equally divided, have everyone write down all their responsibilities (work, school, community, familial, personal etc) and compare notes. It is a good exercise for everyone involved and will be an ice breaker to family adjustments. I give this audiobook and its content a big thumbs up! Please consider reading or a listening to Triggers if you are losing the battle of triggers and struggle with parenting from a place of peace and calm. Wordy, slow and hard to listen to. Wordy, slow and hard to listen to. No energy, very monotone. i tried several times to like this audiobook. ENCOURAGED AND WISER FOR IT! Really enjoyed this book. Really felt encouraged and uplifted throughout the whole process of reading it! Wow! This book knows what mamas deal with. I am so impressed with this book. So many amazing scriptures threaded through-out along with practical and helpful application. The way she reads our hearts as moms is so encouraging. She teaches on all the issues of mamas. Love this book! filled with prayer and scripture this book was much needed for my weary mommy heart. i bought the hard copy and the study guide because 3 chapters in...i knew i would want MORE and to really dig deep. Great book! Applicable for most moms! This book truly was a God-send. It helped so much to know that I am not alone in my struggles as a mom, and that many of us have anger "triggers". God can change us, we can become the parents we want to be for our children. The audio book was so well-done. I appreciated the authors narrating themselves. The chapters were interesting and short enough to digest in bite-sized pieces. I will be going through the book and work book again. Thank you!